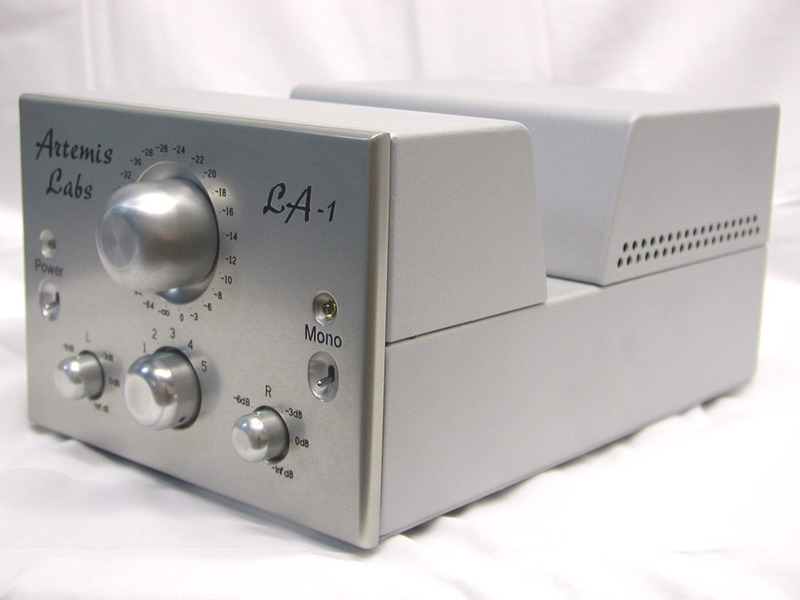 The Artemis Labs LA-1 Line Amplifier combines the clean, accurate sound of a purist single-triode line amplifier with the convenience and reliability of a solid, well-built product. Special care is taken with all parts in the audio path, from the Goldpoint stepped attenuator to the Swedish output chokes by Lundahl. The sonic clarity and detail are outstanding. or signal processor, as well as power amplifier. Series-type stepped attenuator using precision metal-film resistors by Dale and switch mechanism by Elma (Swiss). condition and permits the use of high-quality conductive plastic pots with no sonic degradation yet infinite resolution. The left and right channels can be merged, with a yellow LED indicating the mono condition. One regulator per channel minimizes cross-talk and gives a firm, stable sound without sounding solid-state.